Each of the Defiant maps is based on a location in the Halo universe, on and around the planet Reach. Condemned takes place aboard Orbital Station Gamma, a massive space station high in orbit above the planet Reach. Prior to the Covenant’s invasion, Orbital Station Gamma provided long-range communications for UNSC fleets and a vital lifeline between Reach and Earth. During the battle for Reach, the station suffered terrible punishment at the hands of the Covenant, but a few fortified sections remain intact, fully pressurized, and ready for combat. 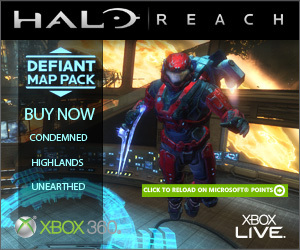 Highlands takes place on the top-secret Military Wilderness Training Preserve on Reach. The Preserve is a large, wooded area where Spartan super-soldiers trained long before the war with the Covenant began. During the Fall of Reach, the Preserve was the site of key battles between the alien invaders and a group of Spartans who used their familiarity with these UNSC training grounds to significant tactical advantage...but not everyone who enters these woods may make it out alive. Unearthed takes the battle for Reach to a large titanium mine and refinery located in the Viery civilian sector of the planet. This particular mine was built to take advantage of the exposed titanium inside a massive meteor crater. The titanium produced here is used in much of the UNSC hardware, from the chassis of the Warthog to the meters-thick armor plating of capital ships like the UNSC Pillar of Autumn. While this facility was quickly abandoned when the Covenant arrived on Reach, it still has significant tactical (and economic) value and so it won’t be long before both humans and the Covenant return to battle for control of it. ©2011 Microsoft Corporation. All Rights Reserved. For the enhanced Halo Waypoint experience you'll need to upgrade to the free Silverlight player. You can continue with the standard experience in HTML.